This is a Pohaniec daughter that belonged to Stall Storgaard, Polonia. Gitte Ehnberg showed us around and we saw the old gentleman Pargos. I couldn't take any pictures of him since he had managed to give himself a mudbath but I'm glad I got to see him before he passed away. Polonia was both a good show mare and broodmare. She came from the mare line of Jamila OA 1927 imp UK. This line is very small on a global scale but in Sweden there are quite a number of horses. It came to Sweden with the mare Noureena (Greatheart x Nouronnihar). Nouronnihar was a granddaughter of Jamila OA. 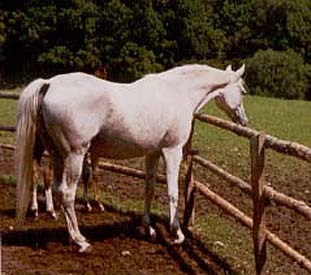 Noureena was the dam of two mares, Nonita 1972 and Sweet Nicolina 1967 by Samba. Both these mares have left important branches. Sweet Nicolina was also the dam of the stallions Mustang 1971 and Nicodar 1974 and several mares, including one exp Germany. This family seems to have an impressive longevity since many of the horses have lived to an old age and also produced foals at an advanced age. One can only speculate if it is the desert blood so up close that gives this longevity.